After lamenting that I didn't find any interesting, new figures at the NOVA Open (for no other reason than I wanted something to paint), I thought about just how many unpainted models I already have. At first I thought, well, there's the Malifaux box I picked up at NOVA, then my unfinished Deep Wars and Hell Dorado models. That's only 2 dozen models between them, really nothing. Then I remembered the Lizardmen army I've started. Then, the Dwarf army I never truly finished. And then all the Stonehaven Dwarves, Gnomes, Elves, and other assorted critters from their Kickstarters. For reasons I still can't explain, I thought it would be a good idea to pull out all my unpainted minis to get an idea of just what all I have going on. Stupid, stupid idea. I feel awful that it's gotten this bad. Where did they all come from? It turns out, I have (without counting every individual figure) about 500 figures hanging around waiting to be painted. Many are assembled and primed, and many of those are even base coated. But most are still in their boxes or blisters. For shame. I realized after I took the photo, that I left out my remaining Dwarves and Stormclaw. But highlights in there include a Mumak, 1/2 a Lizardmen army, a drop pod, Calas Typhon, and a pile of Reaper Bones giants. It also doesn't count any of the minis I am waiting for, which includes the current Stonehaven Miniatures Kickstarter for Half-Orcs, the Raging Heroes Toughest Girls of the Galaxy, and my Reaper Bones. That puts my number at about 150 higher. This collection has been accumulated over only 3 years. Shameful. When I started with my Daemon army, that was all I had for over a year, almost 2. I started strong, at least. Guess I should get off the internet and get painting! I totally sympathise, and have a pretty huge painting backlog myself. I keep a list, so at least I know how bad it is! wow , thats really a huge amount of unpainted figures . Looks like you don't need to buy new ones for the next....two years ? I probably should list them out. It's better than my interim plan, which was to leave them on the kitchen table in order to shame me into painting them faster. Probably 3 years, at the rate I paint. I use "Kanban Flow", which was recommended by "The Independent Characters", and it works quite well. It might be worth a look - it's free online software. :D you're right, which problem ? I'll definitely check that out, thanks! Wow! Nice hoard! I thought I was bad with not painting stuff! I am a slow painter, too. If I painted one every day (hilariously impossible) I'd finish them in a year and a half. But realistically they're 3-4 years worth. The crux of the problem is I can buy them faster than I can paint them! I don't recommend doing it, I am now filled with regret. And shame. 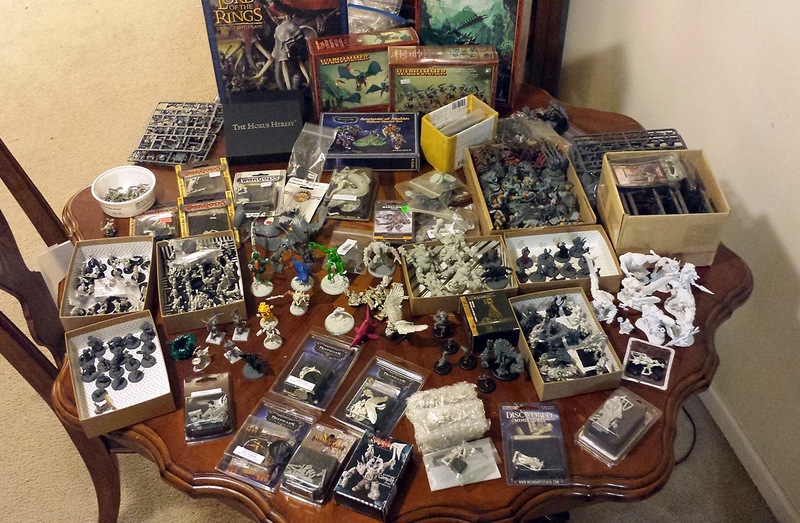 I have SOME shame, I also have ten years of fabric collecting on minis. No one will ever see that. The thing keeping me back from the Mumak is that I know I don't have the painting skill to do its skin justice. I need more practice first. Luckily, I have plenty of minis to practice on. My problem with that plan is that I am a sucker for a great deal. That Mumak? 70% off retail. Stuff like that is how I got here. I think the skin may not be too bad... I figure obviously a base grey to start, then wash with a dark brown to shade. Then dry brush up with a mid and lighter greys using a big soft brush - a lady's blusher brush would be ideal! My mother has a room just dedicated to fabrics. Sometimes I think she has more fabric than I do miniatures. To be perfectly honest, the "hobby room" is really just my Sewing Studio, with minis stuffed in the corner. I did this recently, had a hard think and put a lot of stuff on ebay. Felt much better for it, and able to focus on new projects without old ones nagging at me.